1. Exposure to mold exposure can cause health related conditions such as allergic reactions, asthma, and other respiratory symptoms and complaints. 2. Controlling moisture is the most effective way to control and decrease the growth of mold. There is no practical way to eliminate all mold and mold spores in the indoor environment. 3. If you find mold in your home, you must clean the mold and ensure that sources of moisture are eliminated. 5. Clean and dry any damp or wet building materials and furnishings within 24 to 48 hours to prevent mold growth. 6. 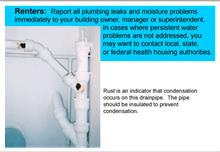 Fix any leaks or water issues in order to prevent mold growth. 7. Water and detergent can be used to clean mold off hard surfaces, make sure you allow the area to dry completely. Absorbent materials that are moldy (such as carpeting and ceiling tiles) may need to be replaced. 9. Do not install carpet In areas where there is a perpetual moisture problem. 10. If moisture is present, molds can be found almost anywhere and they can grow on virtually any substance. Mold can grow on wood, paper, carpet, and foods. truth is, if it lives in your home, mold can cause serious problems. It’s a good idea to have your current or future home inspected for mold by a professional. This ensures that any issues with mold can be addressed before it causes a health problem for you or your family. Moisture control is the key to controlling mold. If you find mold in your home, you should clean up the mold promptly and fix the water problem. Molds are usually not a problem indoors, unless mold spores land on a wet or damp spot and begin growing. Molds have the potential to cause health problems. Molds produce allergens (substances that can cause allergic reactions), irritants and, in some cases, potentially toxic substances (mycotoxins). Inhaling or touching mold or mold spores may cause allergic reactions in sensitive individuals. Allergic responses include hay fever-type symptoms, such as sneezing, runny nose, red eyes, and skin rash (dermatitis). Allergic reactions to mold are common and can be immediate or delayed reactions. Molds can also cause asthma attacks in people with asthma who are allergic to mold. In addition, mold exposure can irritate the eyes, skin, nose, throat and lungs of both mold-allergic and non-allergic people. Symptoms other than the allergic and irritant types are not commonly reported as a result of inhaling mold. Research on mold and health effects is ongoing. This article provides a brief overview; it does not describe all potential health effects related to mold exposure. For more detailed information, consult a health professional. You may also wish to consult your state or local health department.